FOOD GRADE SAFE：use 100% new Oriented Polypropylene （OPP）material,odorless,non-toxic,environmentally friendly,clear than PP、CPP、PE plastic bags. THICKER AND STRONGER：9 x 12 inches（not include flap）2 mils（single side）thickness,Not Gusseted bottom,crystal clear and stronger cello bags have excellent vapor blocking properties,keeping the food and treats fresh,and extends the shelf life. SELF ADHESIVE SEALING STRIP：Widened adhesive sticks to ensure a more tight seal,package better,save fresh longer, resealable self adhesive sealing strip(no Twist Ties are needed) that protects the contents from dust,bugs,moisture,and mildew. WIDE RANGE OF APPLICATIONS:resealable package,in a resealable bag, keep fresh and convenient store and reuse!Available in many sizes and sold in 200 packs, These Self adhesive bags are perfect for holding sweets, cookies, small cakes and candy, etc. It is a perfect present for your homemade gifts. 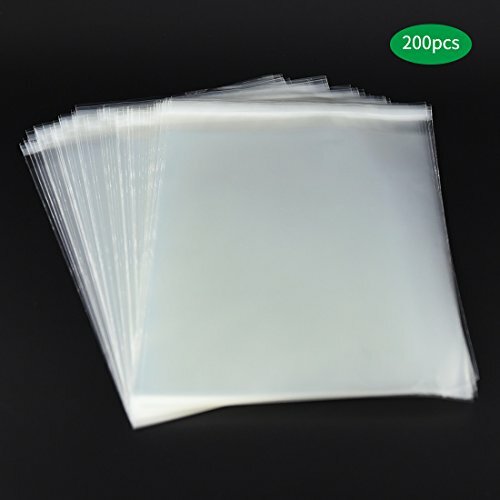 Manufacturer\'s Guarantee :We are confident you will love your our CRJ self-Adhesive bag plastic bag, We will provide a full refund or replacement without any problem! This makes your purchase absolutely risk-free, and you can enjoy testing its quality and durability!